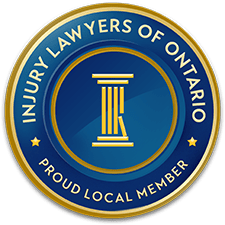 Our personal injury lawyers are dedicated to assisting injured persons in achieving diagnosis, treatment and compensation throughout the Kitchener-Waterloo region. Dietrich Law Office is based in Kitchener, Ontario and assists clients throughout the region including Waterloo, Cambridge, Guelph and Brantford. Our practice is concentrated in personal injury law. Our lawyers are dedicated to assisting injured persons including victims of car accidents, slip and fall accidents, recreational accidents or injuries, boating accidents, snowmobile/ATV accidents, skiing accidents, defective products, motorcycle accidents, dog bites resulting in injury, and other accidents resulting in serious injuries. We’re easily reminded of the potential for being injured when we’re driving in winter road conditions or while walking on icy sidewalks. And, while it’s true that the winter months see the highest number of car accidents in Waterloo Region and in other areas of Ontario, motor vehicle accidents caused by distracted driving, speeding and intoxicated drivers unfortunately occur throughout the year and all too often, accident victims and their families find that their lives are forever altered by these traumatic events. A tragic winter collision occurred on Huron Road in Kitchener, when the driver of a Toyota Tercel lost control of the car, slid sideways into the oncoming lane and was struck by an oncoming vehicle. Of the four young men travelling in the Tercel, one passenger was killed, another passenger and the driver were seriously injured, while the fourth passenger sustained less serious injuries. In the ensuing trial, House v. Baird (2017), the Appeal Court agreed with an earlier ruling that found the Tercel driver and owner equally liable for the accident and injuries. Specifically, the trial judge concluded that the driver was driving too fast given the slushy and snowy road conditions, but the poor condition of the Tercel’s tires also contributed to the vehicle’s risk of crashing, particularly in winter road conditions. Waterloo Regional Police reported that the tires on the 17-year-old Tercel were not road-worthy or safe - they were worn below acceptable levels, mismatched and overinflated - which likely reduced stability and traction, and contributed to the driver’s loss of control. Besides car accidents, there are a broad range of traumatic events that can cause serious injuries which have permanent effects on an accident victim and are life-changing. In Canada, the primary causes of accidental injury are motor vehicle accidents (including cycling accidents, motorcycle accidents and pedestrian accidents); falls (including slip and fall accidents, and falls from a higher elevation); and sports and recreational accidents. Although motor vehicle accidents are the leading cause of fatal injury, we know that any type of accident can result in mild to catastrophic injuries. And, under similar circumstances, the symptoms and recovery times can vary significantly between different people. When we think of a ‘life-changing’ injury, what immediately comes to mind are catastrophic injuries, such as: catastrophic spinal cord injury that results in paraplegia or quadriplegia, traumatic brain injury that interferes with significant function, major organ damage, or the loss of the use of an arm or leg. These are clearly life-changing injuries; however, there are many other forms of injury that can also a have a permanent effect and significantly reduce a person’s quality of life. Any of these injuries may require a significant time until the person feels ‘back to normal’, but for some people, complications such as chronic pain, insomnia, chronic fatigue and depression, can prevent them from regaining the ability to function normally, for many years or even permanently. Persons who are injured in automobile accidents or during the operation of a motor vehicle, including pedestrians and cyclists, may claim ‘no fault’ accident benefits (known as ‘statutory accident benefits’ under Ontario’s Insurance Act) from the vehicle insurance policy of a driver involved in the accident. Under Ontario law, anyone who suffers an impairment or injury while in the operation of a motor vehicle may be eligible for accident benefits. And, if you wish to file a claim, you need notify the automobile insurance company of your accident and injuries within the specified deadline, usually within 7 days of the collision. Under SABs legislation, you may claim income replacement benefits (for the period you were unable to work) or non-earner benefits. You may also claim medical and rehabilitation/attendant care benefits for expenses that arose as a result of your accident, but the maximum amount and duration for which you are eligible, with respect to these benefits, depends on whether your injury is deemed as minor, non-catastrophic or catastrophic. Persons who suffered a catastrophic injury may also claim a housekeeping benefit and caregiver benefit. All of the stated benefits are available to everyone under the standard automobile policy; however, policyholders may increase their level of benefits by paying a higher premium. Automobile accident victims actually have several options for compensation, since any accident victim who sustained injuries caused by another person’s negligence or a failure to take reasonable care, may file a lawsuit against the ‘at fault’ party, in order to obtain compensation for losses and expenses (i.e. damages) arising from their injury. Damages may include non-economic losses, such as pain and suffering, and loss of enjoyment in life; as well as economic losses, such as lost income, medical and rehabilitation costs, education costs, home maintenance and housekeeping expenses, and vehicle and home modifications that were required to accommodate a disability. In cases where an accident victim sustained a fatal injury, family members may sue the negligent party for monetary expenses associated with the wrongful death of their loved one (including lost wages if the deceased person contributed an income), as well as the loss of guidance, care, companionship that they could have reasonably expected if they did not lose their loved one. 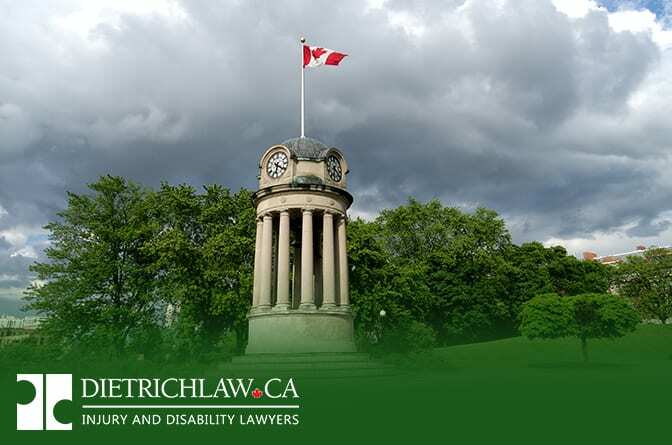 If you were injured or lost a family member as a result of another person’s negligence, whether due to a car accident, slip and fall accident or another traumatic event, talk to an experienced Kitchener injury lawyer at Dietrich Law. After discussing the unique circumstances of your case, we can offer an honest assessment of the strength of your case, provide answers to your questions, and can explain what’s involved in winning a settlement. We will also ensure that you don’t miss any deadlines for filing your claim. If the City of Kitchener or another municipality is named as one of the defendants in your claim, there is a particular urgency in promptly commencing your lawsuit in order to meet the 10-day notification deadline for municipalities.